Quick Study: Ludmila Petrushevskaya is one of contemporary Russia’s most distinctive writers: she is especially renowned as a writer of dark and creepy short stories, a dramatist who loves absurdity, and a cabaret performer. 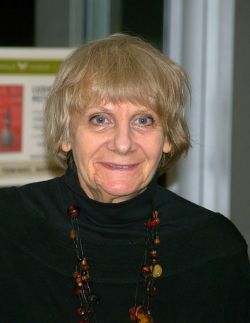 The Petrushevskaya File: Though Ludmila Petrushevskaya wrote during the Soviet era, her work, which often looks at seamy and uncomfortable aspects of life, was generally banned, remaining largely unpublished until perestroika, when her collection Immortal Love came out in the late 1980s. Her novella The Time: Night was a finalist for the 1992 Russian Booker Prize and her work has gone on to be translated into more than two dozen languages: the English-language collection There Once Lived a Woman who Tried to Kill Her Neighbor’s Baby hit the New York Times bestseller list in late 2009. Petrushevskaya’s plays have been staged in several of Moscow’s best-known theaters… and in venues around the world. Petrushevskaya Recommends: In a piece on the Russian Snob site, Petrushevskaya is said to like the writings of Marcel Proust and Georgian philosopher Merab Mamardashvili. Fiction and nonfiction works in anthologies and periodicals include: “Joe Juan” in Life Stories (Russian Information Services, 2009, tr. Lise Brody), “Waterloo Bridge” and “The House with a Fountain” in Nine of Russia’s Foremost Women Writers (Glas, 2003, tr. Sally Laird and Ellen Pinchuk, respectively), “Ludmila” in A Will & a Way (Glas, 1996, tr. Jane Taubman), “Our Crowd” in Glasnost: An Anthology of Russian Literature Under Gorbachev (Ardis, 1990, tr. Helena Goscilo), and “The Violin” and “Mania” in Balancing Acts: Contemporary Stories by Russian Women (Laurel, 1989, tr. Marina Astman and Helen Goscilo, respectively), as well as pieces in such publications as The Paris Review, Harper’s, and The New Yorker.